Rising in the Angolan highlands, The Chobe River flows through riverine forests, floodplains and open woodlands en-route to its juncture with the Zambezi River, the meeting place of four African countries – Botswana, Namibia, Zambia and Zimbabwe, which are all familiar names to safari-enthusiasts. The Namibian portion of this river is found on the border with Botswana along the Caprivi Strip and is a premier wildlife destination just 96 minutes’ from Windhoek by air. Using your Windhoek accommodation as a starting point when flying into the country, a trip to the Caprivi wilderness is easily combined with other aspects of your Namibian holiday, including a trip to Etosha National Park. The Chobe River and floodplains support an abundance of wildlife and are an excellent destination to enjoy the unique experience of viewing many species from the water or on a 4×4 trip through largely untamed terrain. A boat trip along the Chobe River provides a window into Botswana’s Chobe National Park, which is unfenced along the river, providing game with free access to the Caprivi Strip. Enormous herds of buffalo, zebra and wildebeest are some of the most common sightings in this area, while predators such as leopard, cheetah, lion and spotted hyena lurk in the shadows. The rare puku is a cherished sighting along this watercourse. The reed-lined canals of the Chobe floodplains provide opportunities for boat trips among an abundance of birds, as well as close encounters with elephant, hippo and other water-loving animals. Specialised birding and photography trips can be arranged for enthusiasts, and you can even spend a few nights on the water in a houseboat for a peerless safari adventure. Staying on board a houseboat gives you 24-hour access to all the action on the river. Savour your first cup of morning coffee on the elevated viewing deck and dining area, while nocturnal animals slink away from the waters to their daily hideouts. Hear birds emerge with the sun, greeting the dawn enthusiastically, and watch as the herds descend on the river banks to slake their early thirst. Spend your day adrift, fishing, sunbathing, or in tranquil repose as an endless parade of creatures dips in and out of sight along the river, unaware of or unfazed by your presence. Catch close up glimpses of elephants by the dozen splashing and bathing in the depths, watch the African fish eagle swoop down on its next meal and observe the lazy half-submerged antics of the hippos from the comfort of your temporary home, a million miles from everyday concerns. As dusk approaches, the whole process repeats itself in reverse, the hunters emerge from their daytime repose, while antelope, buffalo and zebra drink their fill before the night falls. Perhaps you will be lucky enough to witness the thrill of the chase should their paths collide, perhaps you will simply enjoy your sundowner viewing a spectacular sunset cloaked in a type of silence known nowhere else on earth. Either way you will retire in cocooned comfort to your spacious cabin with its floor to ceiling windows providing an ongoing outlook over the river. The luxury houseboats cater for all your earthly needs with a trained skipper-come-guide to nurture your passage and a chef to satisfy your culinary requirements. 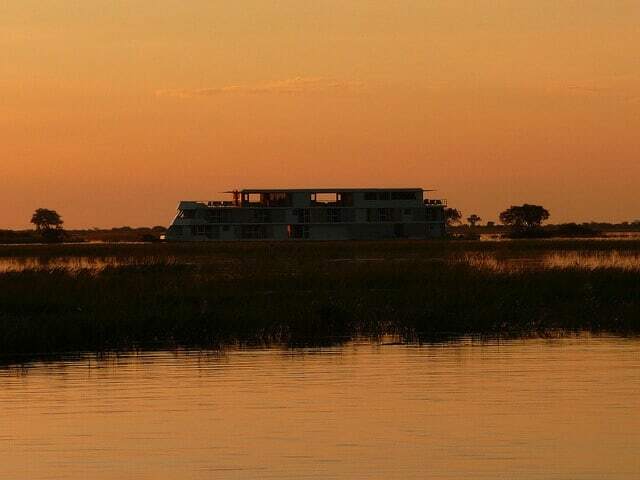 To take to the waters of Chobe on a houseboat is to take Africa to heart, surrounded by unequalled wildlife viewing opportunities and shrouded in five-star luxury. Are you game?